Today is the last day of (phase 1) of our Foothill Drive Project! We're wrapping up a few other spaces in the home and will be sharing those as soon as we can! If you're just tuning in, we've already shared the video, formal living, office, and great room tours. 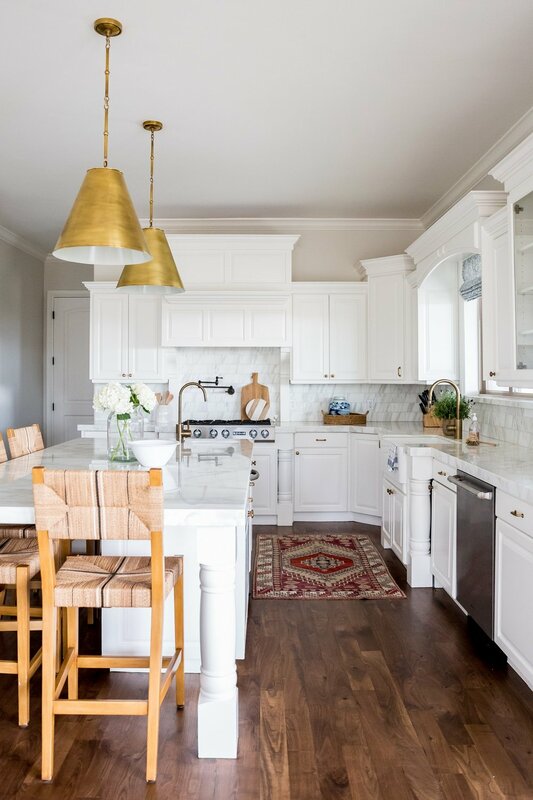 With its staggered cabinets, speckled granite, and yellow barstools, the before was really intense. Our client was already under construction and in the middle of painting/selecting marble when she first hired us and then we helped pull it all together. Although there are details about the cabinet design that we wouldn't have necessarily done if we were starting from scratch, it's incredible how those things seem to fade with a fresh coat of white paint. I mean, I'm shocked and I see kitchen remodels all the time!